This page is where I (Ed Braaten, aka N7EKB), keep things related to my hobby of Amateur radio. My introduction to the world of radios began in a police car at the age of 5 - I was fascinated by all the chatter and squelch tails. I got involved with shortwave listening in high school. I collected a number of QSL cards from international broadcasters and listened to a lot of Deutsche Welle. After several thwarted attempts through the years I finally studied and passed the test for a No-Code Technician license in November, 1997. Shortly after getting my Technician license, I taught myself Morse Code and became proficient at the blazing speed of 5 WPM. I passed the 5 WPM Morse Code examination and was able to upgrade to a Technician Plus license in December 1997. My original callsign was "KF6OQI". When the FCC Opened their Gate 4 Vanity Callsign Program in December, 1997, I applied for the vanity callsign "K6EKB". I was inspired to apply for this callsign (which matches my initials) by my Elmer in those days, "K6KRD" whose callsign also matches his initials. On 7 January, 1998 the FCC granted me the "K6EKB" callsign. After some theory study and some more practice with Morse code (13 WPM), I upgraded to General Class in May 1998. Many years later (April 13th, 2004 to be exact) after hitting the books again and participating in an excellent class held by Jerry Seligman, W7BUN, (Silent Key, Aug 16th, 2006) from the Radio Club of Tacoma, I finally upgraded to Amateur Extra Class. I've lived in the Pacific Northwest since 2001, but didn't try to update my vanity call to match the "7" call area until I applied for N7EKB on January 31st, 2017. The FCC accepted my application and made the N7EKB grant official on February 18th, 2017. I carry a DMR handheld radio (currently the AnyTone AT-D868UV dual-band VHF/UHF purchased from Powerwerx) just about everywhere I go, near or far. So your best bet for a radio contact would be to make a direct call to my DMR ID (3153410). This is known on DMR as a "private" call. Alternatively, you could call me on TG 31771 (Pacific Northwest Regional, or "PNWR 2" on PNW Repeaters). The cool thing about DMR is that I can be just about anywhere in the world and I'll still be "in range" for a full-quieting contact thanks to my homebrew hotspot(s). On analog 2M FM you can try contacting me on the Radio Club of Tacoma's Crawford Peak repeater on 147.380+, PL 103.5. This repeater has excellent coverage of about every mobile destination I usually frequent and is full-quieting with a one watt handheld at my home QTH. If you thought the picture of me on this page was taken in N7EKB's shack, guess again! Note the "KH6BB" on the bulletin board behind me. 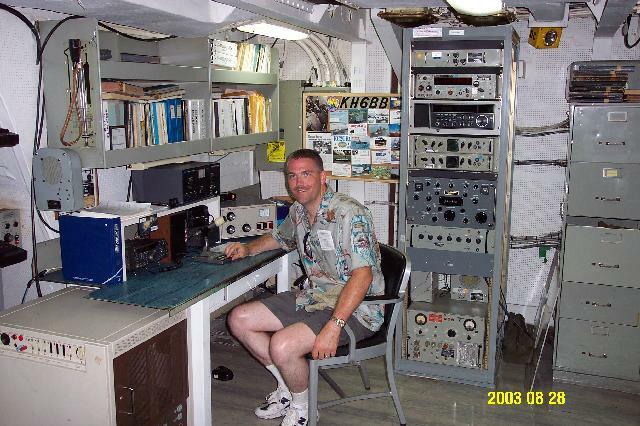 The picture was taken while I was visiting aboard the battleship USS Missouri in the summer of 2003. None of the hams were on board that day so I didn't get to operate KH6BB, but it was a fun visit nevertheless! My radio shack is setup in an upstairs room in my house near Rainier, WA. The grid-square is CN86PV and the ICBM coordinates are 46° 54.279' N and 122° 42.118' W. For HF my antenna is an Alpha Antenna J-Pole Sr 60 ft end-fed antenna mounted horizontally about 24 ft off the ground running from the eave of my house out to a fir tree in the yard. The antenna is level to the ground to maximize a Near Vertical Incidence Skywave (NVIS) radiation pattern for my primary HF operating bands of 80 and 60 meters. The main HF rig in the shack is a Yaesu FT-857D which I use for HF voice and HF/VHF digital packet modes (Winlink e-mail - N7EKB@winlink.org). The main VHF/UHF radio is a Tytera MD-9600 dual band DMR and analog radio. The secondary VHF radio is an Alinco DR-235T for the 1.25m band. I also have an APRS node (N7EKB-1), and a DMR hotspot running at other locations on the property. See the sections below for more details on the DMR hotspot setup. I've been running Linux on all of my home computers including those in my radio shack for over a decade now. I program all of my radios on my Linux laptop using the CHIRP program or free software from the manufacturers. I'm running a DVMega homebrew DMR hotspot consisting of a Raspberry Pi 3 computer and the DVMega RPI single-band UHF radio module in my home QTH to connect to the worldwide BrandMeister DMR network. The Raspberry Pi 3 is running the KB5RAB image. The KB5RAB image was by far the best documented and most complete image for a DVMega hotspot that I was able to find when I searched the Internet during my spring 2017 DMR hotspot homebrew project. The frequency for this 10mW hotspot is 432.550 MHz (CC 14). You can monitor this hotspot on the Brandmeister network by clicking on this link. I built a second DVMega homebrew hotspot that can ride along in my car or in a backpack. 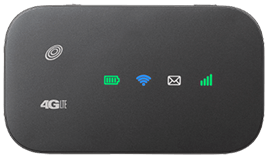 You can monitor this mobile hotspot on the Brandmeister network by clicking on this link. 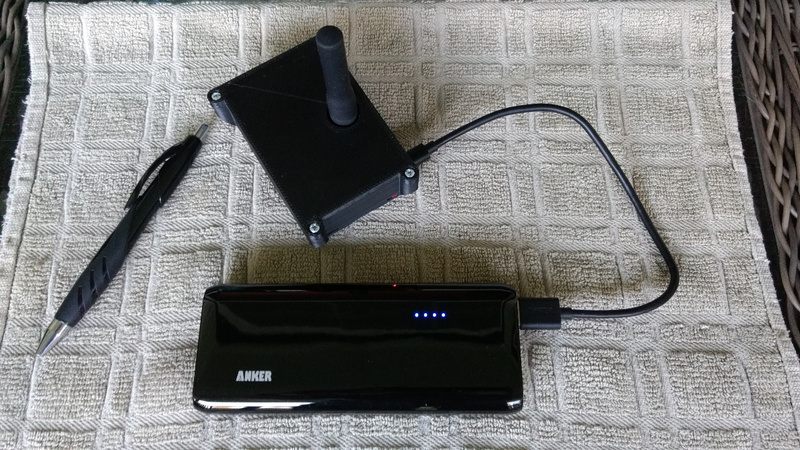 Below is a picture of my mobile homebrew DMR hotspot. Not shown is the StraightTalk mobile ZTE 4G-LTE device that provides a wi-fi hotspot for the Raspberry Pi while I'm portable/mobile. I'm the ARRL appointed volunteer Emergency Coordinator for the East Thurston County (ETC) Amateur Radio Emergency Service (ARES) Team. To learn more about the ETC ARES team, follow this link: https://etc-ares.org/. I'm a life member of the ARRL and a regular member of the local Yelm Amateur Radio Group. I'm member #4334 of FISTS International. I'm also a member of the Ten-Ten International Net with 10-10 number 69377. Copyright (C) 1998-2017 by Ed Braaten. All rights reserved.